I love to read. I have a lot to say about what I read. Under the endless skies of Botswana, there is always something Mma Ramotswe can do to help someone and here she finds herself assisting a woman looking for her family. The problem is the woman doesn't know her real name or whether any of her family members are still alive. Meanwhile, Mma Makutsi is the recipient of a beautiful new bed that causes more than a few sleepless nights. And, at Tlokweng Road Speedy Motors, Mr. J.L.B. Matekoni has come under the influence of a doctor promising a miracle cure for his daughter's medical condition, which Mma Ramotswe finds hard to accept. Nonetheless, Precious Ramotswe handles these things in her usual compassionate and good-natured way, while always finding time for a cup of red bush tea. When I need a break from the world, I pick up the next book in No. 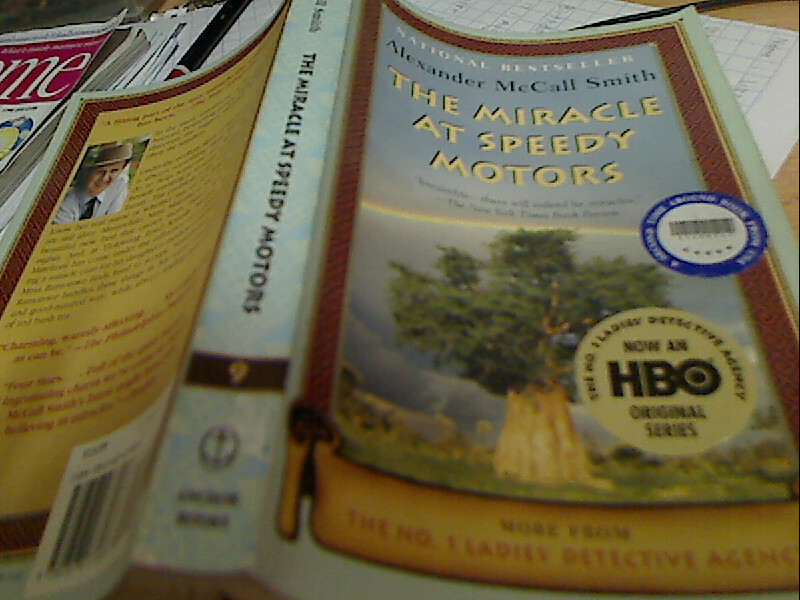 1 Ladies Detective Agency Series and for a couple of days or maybe even hours (depending), I would be transported to a gentle, simple and logical world of Mma Precious Ramotswe. This time round, it's the 9th book in the series entitled The Miracle At Speedy Motors and like usual it's so different to be in Mma Ramotswe's world. Not that everything is easy cos on the contrary, life is difficult but the perspective of life is very different and can even be said to be extremely logical. The cases that Mma Ramotswe were asked to solve were not really that extra ordinary but her approaches are certainly as interesting as her results. We must also not forget Mma Makutsi who together with her fiancee bought a bed but the bed was left accidently to the harsh elements of nature and was destroyed. I certainly hope that this is not a reflection of Mma Makutsi and Phuti Radiphuti's future relationship as husband and wife. For the rest of the titles under the No. 1 Ladies Detective Agency Series that I have wrote about, please visit my Index page.